Our own portable rig makes it easy to bring aerial acts to any location and any event. 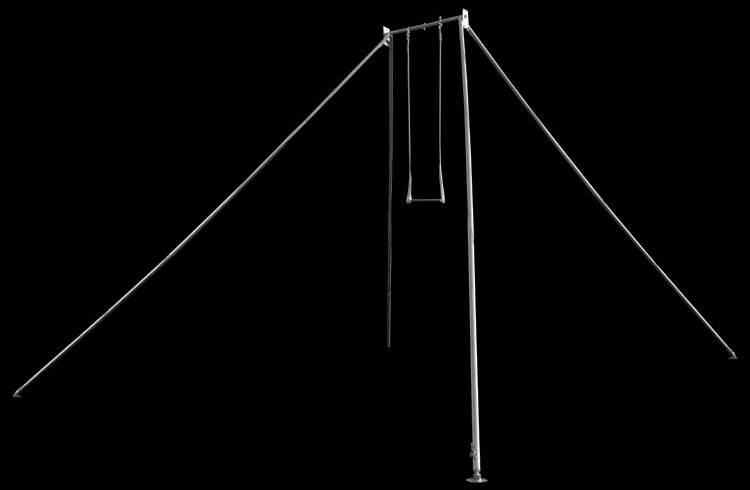 6 meters high and 8x8meters wide freestanding aerial frame just needs flat ground and can be build in minutes. This polished aluminum rig is suitable for indoor and outdoor and requires 33x33ft (10x10m) flat unobstructed/clear ground area with 19ft (6m) height clearance. It can be used on grass, concrete or any hard floor and even surfaces. With the rubber soles it never leaves a scrach on the floor. Quick and easy to assemble, it can be built with 3-4 people in 10 min! 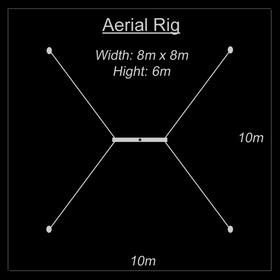 This standard setup will provide the aerialist with an 18.5ft (5,5m) rigging height and can allow for exciting aerial performances. 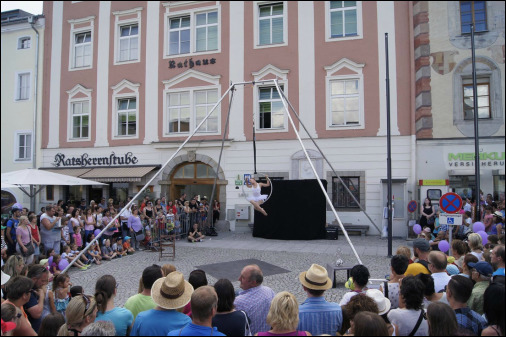 The rig can be used for streetshows, festivals, theater, for solo- and duet-performances or for workshops and makes it easy to bring aerial to any location and any occation. Our Performances with the rig include duo aerial acts, silks, slings, trapeze, lyra, corde lisse und aerial net. A wide range of performances can be provided with it by us suiting your event. e.g. Nicely arranged between tables at a gala event, decorated for a wedding, on top of a pool or simply like it is, it will be definitely a highlight of your event. The rig can be hired for workshops or festivals, with one of our staff managing the build up , take down and maintaing the rig. Use of the rig is on own risk!